The Inracks integrated console environmental management system provides console level heating and cooling controls to manage operator comfort throughout shifts. A comfortable workspace encourages maximum operator focus in the control room. 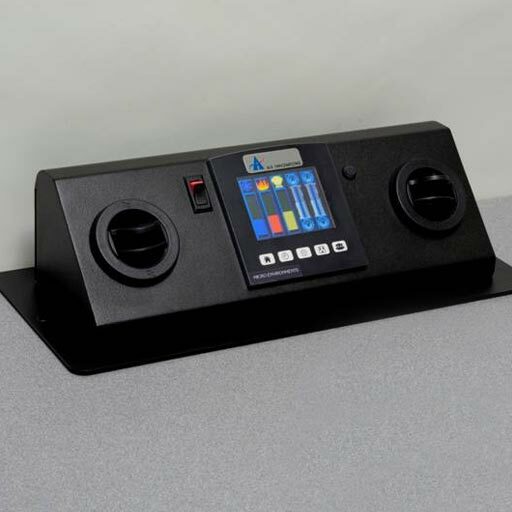 The Inracks console micro environmental management system is a personal desktop climate control system that is attached to a work surface, combining environmental control, lighting control and lift functions inside a single unit. The heating or cooling airflow can be adjusted via louvers, which allow the user to direct the airflow on their 911 dispatch console. These environmental control consoles create personal environments for each user and are available in two models: a self-contained, one-piece design and a design with ducted supply air.